Good-on accounta I like HBWCs better, but just bought several thousand 158g SWCs. I'll take that bet...but I only have 1lb of BE left. Where did you hear this? I could never get the 158gr LSWCs to fly any good past 49 yards. Scuttlebut is that the current rule won't be re-written and the current rule only requires the revolver to be capable of firing 158-gr. Some seem to welcome the prospect of the "clarification" meaning any safe ammo. The traditionalist in me already dislikes the reality of super-light loadings being used. Kinda like the Hardball rule for DCM Leg matches, I think it should be harder solely because the game is shot using duty-type or power level ammo and not powder puff stuff. STILL, I'd like a clarification that would let me use my lighter SWCs. When cast soft for .38, they are running 148-149 gr, and I get good accuracy from 710 fps up to the high 800s. The +P 1150 fps load shows promise but might be only a 4-inch load at 50... There would be something about competing with my own cast bullets. I do wish that they would send an official letter out to match directors to let them know what they figure the rules are. We read last month on this forum that it was a done deal and any safe ammo was going to be the rule. I fired a practice (Reeves not DSR) with my 14-6 and 110gr xtp ammo last month in the last outdoor 2700 of the year here in Oregon. I made a copy of the letter(post) we got and showed it to the other revolver shooters. Any safe ammo would be a game changer. I only fired a 273-5x but that was about 20 points higher than normal for me than with 158gr bullets. Hope they figure it out before next summer. 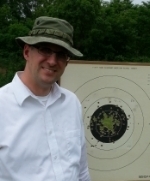 I can shoot in the 270s with Remington UMC 158gr LRN ammo--but not consistently. I can frequently hit the 270s with 148 HBWC. I prefer shooting the 148gr bullets and wouldn't mind if that was an allowed ammo. Neil Kravitz sent me an email advising that he believes that the information provided to you regarding DR ammo was incorrect. According to current wording, the information given to you is correct, that any safe ammo can be used. However, you must use a revolver that is CAPABLE of chambering and firing a 158gr round, not that you have to use that round. Beth Martin personally contacted me for clarification before sending the information out to you. I was on the Pistol Committee when this was done and, due to a severe component shortage and an apparent supply of 130gr military ball ammo, it was decided to get out of the bullet weight business. So unless the committee changes the wording, any safe ammo can be used. WOOHOOO!! Does that mean I get the 3lbs of bullseye?! Rob Kovach wrote: WOOHOOO!! Does that mean I get the 3lbs of bullseye?! I wouldn't pay up yet. There were weasel words in that letter " So unless the committee changes the wording". That leaves it wide open still in my interpretation. Sounds like I'm going to have to do some dancin' to get the powder! Anyone payoff on that bet? I think the rule was created to prevent the custom PPC guns that had cylinders shortened from entering. Back in the 1970s it was a hot setup to have a customized revolver with a short cylinder . I know I'm dating myself. 3.1.4 Distinguished Revolver - The revolver must be capable of chambering and firing a 158-grain round nose or Semi-Wadcutter .38 Special cartridge. It must be a factory manufactured revolver with no external modifications except for stocks which may be modified or changed because of the size of the competitor’s hand or to facilitate loading. Except for stocks and the honing of 12 the sear or sear notch to make a more crisp trigger, and maintain a 2 1/2 lb. minimum trigger pull, no external or internal modification may be made to the revolver as manufactured and sold by the factory of origin. No parts may be removed from the revolver, either externally or internally, nor may any part be added, with the exception of milling the cylinder to accommodate moon clips. Specifically prohibited is any system of recoil control based upon compensators, barrel venting, barrel porting or weighted grips. Exposed holes that have been drilled and tapped for mounting of a scope are not considered to be an external modification. (a) Trigger- Must have single and double action capability and must be capable of lifting 2 1/2 lbs when the revolver is cocked for single action firing. Triggers will be weighed. Any trigger, sold by the manufacturer of the revolver, without modification, may be used. (b) Sights- Fixed or adjustable rear sights may be used. An Adjustable front sight is not allowed. (d) Stocks- Except as set forth above, the right and left stocks must be mirror images of each other. (e) Ammunition- Any safe .38 caliber ammunition using the 158 grain round nose or Semi-Wadcutter bullet only. (f) The following are not allowed. Trigger shoes, compensators of type or design; any external trigger stop device; any internal trigger stop not originally installed by the factory as original equipment in stock revolvers of the same make and model; tape on the stocks or stocks flared at the base. So, just chambering the 158gr load doesn't cut it. You have to shoot 158gr Round Nose or Semi-wadcutter. The only thing that has changed is that lead bullets are no longer required. So, is it possible to add enough bismuth to my lead to turn those great 145-150-gr SWCs into a full 158 grains in weight? As cast right now they are 149-151 grains...supposed to be 145s, or so I've heard. ...but I really haven't seen anybody pulling bullets. I think if you are running lead SWCs that look like 158gr LSWCs, you are probably ok. Now shoot 270s with them. GrumpyOldMan wrote: So, is it possible to add enough bismuth to my lead to turn those great 145-150-gr SWCs into a full 158 grains in weight? As cast right now they are 149-151 grains...supposed to be 145s, or so I've heard. You need a tantalum pellet in the bullet. Hi, would Zero 158gr SWCHP be allowed under these current rules interpretation? Much like the 185 JHP is allowed in Service Pistol. SNaymola wrote: Hi, would Zero 158gr SWCHP be allowed under these current rules interpretation? Much like the 185 JHP is allowed in Service Pistol. the only part of it limits the shooter to using RN or SWC bullets; hollow-points are not allowed. I emailed the NRA a few months ago about using hollow points, and received an answer specifically stating they are NOT allowed. Well, that's 2 no's. So I guess you can't use them for Dist'd Revolver. Thanks for the response.